Wholesale Personalized Montly Desk Planners. Promotional, Inexpensive. Budget Prices for USA, Canada. Bulk Custom Monthly Desk planners on sale. This bargain promotional desk planner comes with upgraded vinyl cover, thought-provoking monthly quotes, 5 month calendar at a glance, holidays page, time zone map and Julian dates. 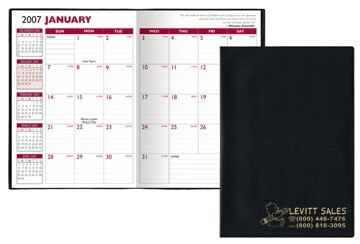 Our custom imprinted planners are a great giveaway and it is a sure to be used daily by any business. Features a large space for notes. It is a gift that will be truly appreciated. Free artwork design. Budget Prices for USA, Canada for personalized desk planners. American clients pay no taxes. UNIT PRICES below include your one color custom imprint. Since the vinyl cover is removable, the following years you may just order the inserts for $1.35 each. Setup Charge: $45.00 per color; no Setup Charge on Repeat Orders. COVER MATERIAL: Vinyl. The cover is removable, so the following years you may just order the inserts for $1.35 each. IMPRINT COLORS: Gold, Silver, White and any others. IMPRINT SIZE: 3 1/4" x 5"
OTHER FEATURES: large notes area, holidays page, time zone map, monthly quotes.